From Tama County in Iowa, we headed southeast to Marengo. I was still hoping to gather some information on Cliff Berry, computer pioneer. Berry lived there with his father from about age 11 to age 14. Then in 1932 his father, Fred Berry, was shot, apparently over an argument about a proposed municipal power plant in Marengo. Berry was the local manager of Iowa Power at the time. By the time we reached Marengo, it was getting late and I merely noted that they had a good sized library and we continued on. My next planned stop was St. Louis. We got as far as Hannibal Missouri that evening. 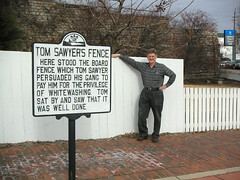 Now you are probably thinking, "Tom Sawyer in Hannibal? Let's see pictures." We didn't take any on this trip because we had made a stop here back in 2004 on our way south to the Alabama Gulf coast. But here are a couple of photos from the earlier trip. 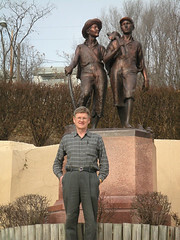 On the left, I am with my fence and on the right I'm with a bronze copy of Mark and Huck. My reason for wanting to travel via St. Louis was to look up some old newspapers and find an account of American Arithmometer packing up and leaving town, lock stock and barrel. American Arithmometer manufactured the very successful Burroughs adding machine at the turn of the century. In 1904, they apparently rented a special train and moved 500 employees to Detroit. One might expect to find something about that in the local St. Louis newspapers. While in Hannibal, I discovered that the central St Louis library was undergoing remodeling and that the microfilm collection of newspapers was not accessible. I was redirected to the county library. We headed there the next day and found that the St. Louis Post Dispatch is available in very high quality scanned form if you have a computer within the library building. Unfortunately, there was no story on American Arithmometer's move. I did pick up a few other good pieces of information, though. We left the library a bit after one o'clock in the afternoon and headed a few miles south for Kimmswick, Missouri. 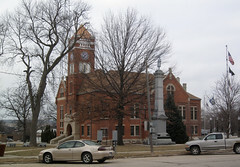 From Gladbrook, it is about twenty miles south to Toledo, the county seat. Toledo has an attractive county court house building and the unique style of traffic signal that I have only encountered in a few places. Near the courthouse there is a museum and genealogical library. Since they didn't open until 1:00 p.m., we decided to look for a place to eat. Cruising slowly through town, we didn't find a restaurant. We proceeded to ask "Miss Garmin," our trusty GPS, and she took us around the block again telling us to to stop at this building. We had missed the "Open" sign on the Trojan Inn on our own. This is a good restaurant. Try the chili soup! We returned to the Genealogy Library and file cabinets there yielded a folder of newspaper clippings from Gladbrook. They also have the Gladbrook newspaper on microfilm which I will probably browse on a return trip. 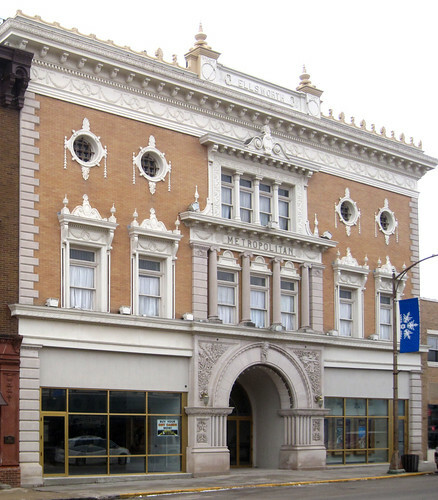 Gladbrook, Iowa, doesn't give off the feeling of early twentieth century wealth that Iowa Falls presents to a visitor. 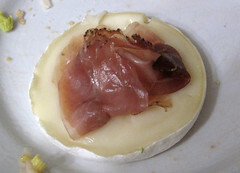 But it does offer some unique treats for the visitor and has some historic significance. 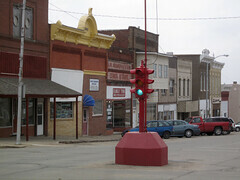 Gladbrook is a town of about one thousand located some fifty miles to the southeast of Iowa Falls. 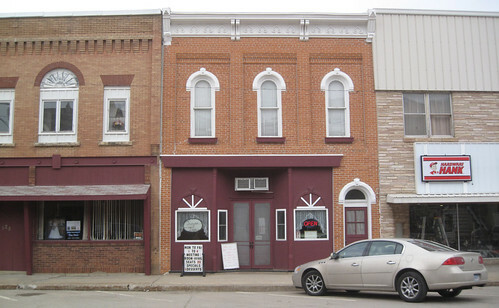 Gladbrook was the birthplace of Clifford Berry, half of the developers of the Atanasoff-Berry-Computer at Iowa State in 1939-40. I knew the street that the Berry family lived on but not the address. Berry's father was the local manager of Iowa Power which also was responsible for creating radio station KFIK in Gladbrook in the 1920-23 era. I soon discovered that the library here doesn't open until noon and we were a bit early. I spent some time peeking in the window of the Matchstick Marvels Museum while I waited. Unfortunately, the museum is only open from April through November. The view through the window showed an impressive ship made of matchsticks and I discovered from one of the people in the adjoining City Hall that some other exhibits are "on tour" when the museum is closed. Back at the library, I found a very helpful librarian who located a copy of the town's centennial book, 1880-1980 with a couple of references to the Berry family. She also pointed me to Toledo, the county seat of Tama county where Gladbrook is located. Our plan was to head for Houston, Texas. It was definitely warm and we have friends there. Most people think of the drive from Minneapolis to Houston as a long one day drive or an easy two day drive. We have more imagination than most. I wanted to visit Gladbrook, Iowa, Marengo, Iowa and St. Louis, Missouri. These stops are all related to a book I am working on about the early history of Burroughs computers. The package from DirecTV arrived on Tuesday morning. It was quickly installed and should make our house-and-cat-sitter much happier. We made it as far as Iowa Falls, Iowa, on the first day. This would leave us with a short drive to Gladbrook the next morning. The 150 miles or so we had traveled from Minneapolis to the south makes quite a difference in climate. 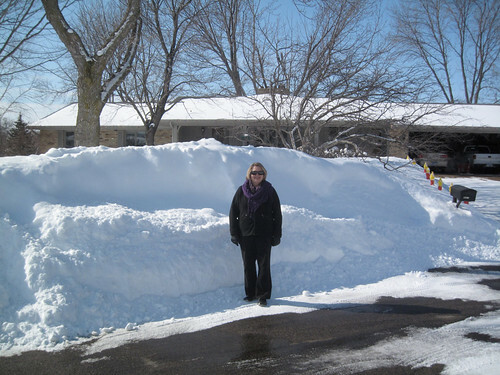 From Minneapolis to the north, the ground remains snow-covered from about late November until sometime in March, each year. 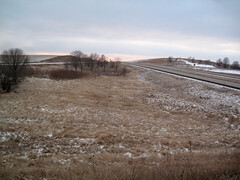 In central Iowa, snow comes and goes throughout much of the winter. 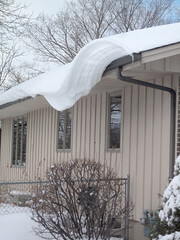 By the time we had reached Iowa Falls the crazy snow sculptures hanging from the roofs in the Twin Cities had given way to nearly bare ground. Iowa Falls is a town of about 5,000 in the rich black-earth farmland along the Iowa River. We drove into the downtown area for dinner. We noted a large Cargill seed-oil plant and several railroad tracks. It turns out that Iowa Falls is a crossroads for the Union Pacific and the Canadian National rail lines. This location on two rail lines and the river must have made the city a very wealthy community in the early 1900s judging from the homes lining the broad Main Street divided with an attractive center boulevard. 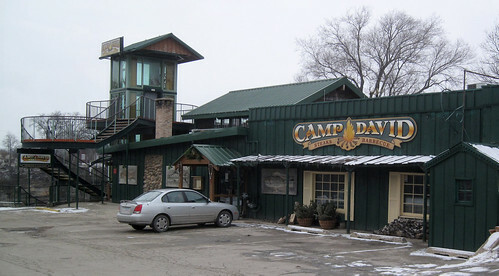 Dinner was at Camp David, situated on the Iowa River. I had the obligatory Iowa pork chop. The architectural gem of the community is its movie theater. This historic Metropolitan Opera House dates from 1899. It was restored a few years ago (at considerable expense according to one local businessman that I spoke with) and is worth a look if you are in the neighborhood. Home For A Few Days. Blizzard Time. When we left Egypt, I thought that we might be coming back for the remainder of our winter. That didn't look like it was going to work out, though. We decided to head back to Minneapolis and then head for the South by car. We changed our ticket to depart from Milan and then pick up a flight to Minneapolis from Amsterdam. 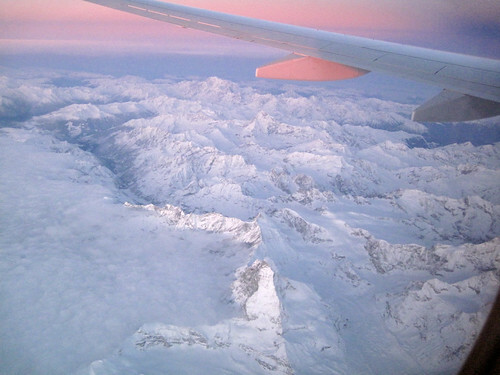 We left Milan early in the morning, crossing the Alps as the sun rose. 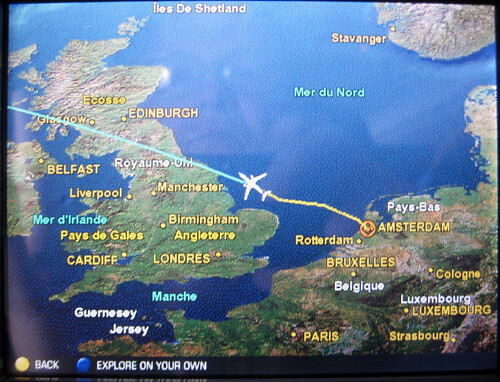 The flight from Amsterdam to Minneapolis is about nine hours. We arrived home to find the temperature in the low 40s. The early December snowstorm that dropped twenty inches of snow, collapsing the roof of the Metrodome was barely a memory. 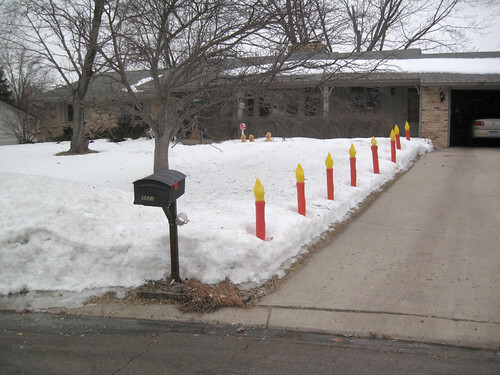 I had hopes that this year I might be able to remove the Christmas candles from beside the driveway before March. We arrived home on Thursday. After a weekend catching up on the mail, I began getting anxious to hit the road since more snow was predicted for Monday. 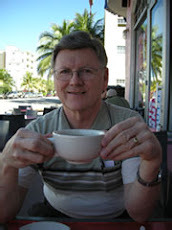 Unfortunately, I was waiting for a replacement receiver to arrive from DirecTV following my call on Thursday. Monday was a holiday. On Sunday, snow began falling. 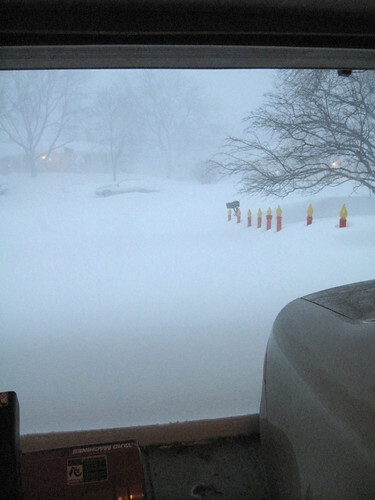 Here is what a blizzard looks like in the city. Monday was spent clearing the snow instead of driving away from it. By Tuesday morning, the sun was shining and the snow was cleared from the driveway. 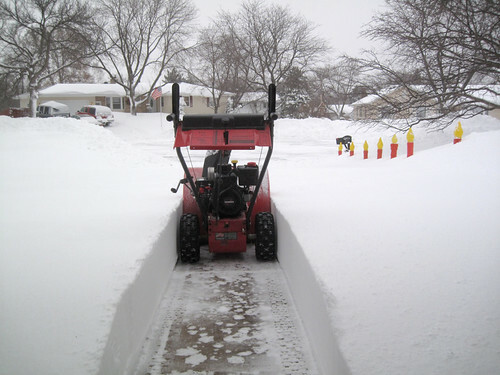 The city of Bloomington had also cleared the snow from the street. We were on the road again. 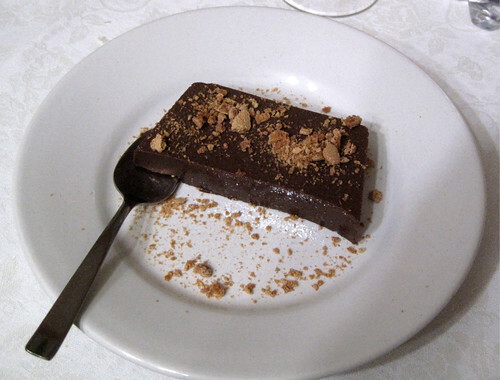 After enjoying dinner in Maria's kitchen several times, it was time for us to treat. 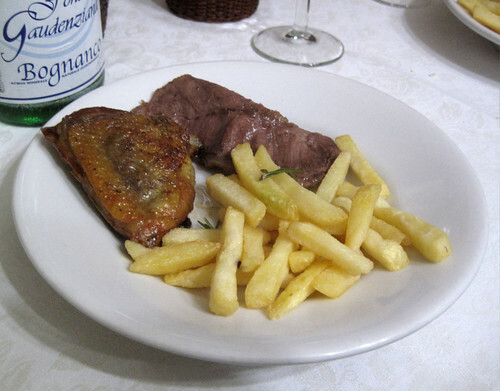 We scheduled a slightly delayed Valentine's Day dinner in that small restaurant on top of the ridge in Sessant. Since the restaurant is seldom open in winter, this necessitated a bit of advance planning. 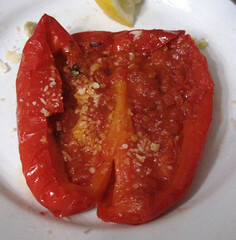 The owner and his mother, who serves as cook, prepared a fire in the stove and we ordered dinner "as the chef prefers." 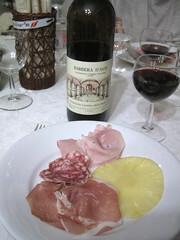 Dinner was served as a lengthy series of courses, accompanied by the local Barbera D'Asti, of course. 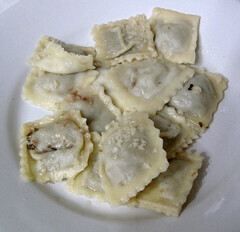 All were delicious, but I'll let the pictures speak for themselves. 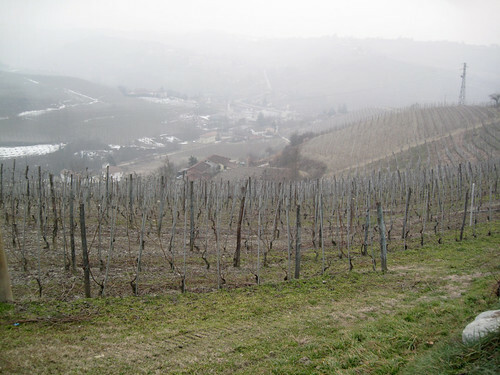 The grape vines lay dormant and were shrouded in fog during much of our visit to the area. 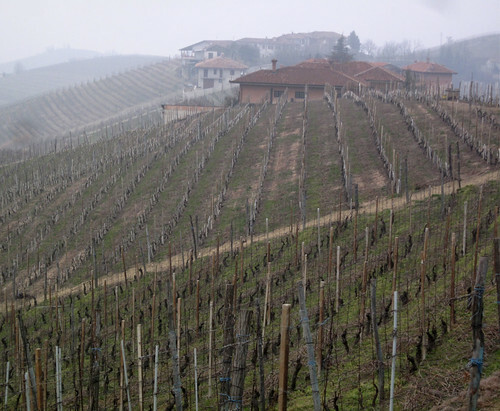 This should not be surprising since the grape of the area is the Nebbiolo and Nebbia means fog in Italian. So, we had to use our imagination to picture the grapes at harvest time. 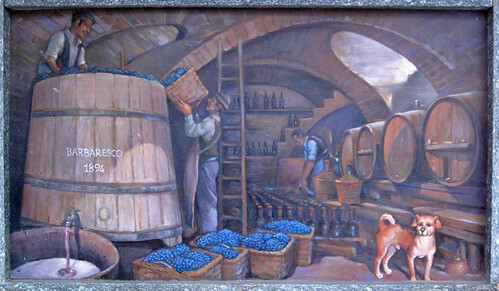 And with a little more imagination, I could even see the wine-makers hard at work. 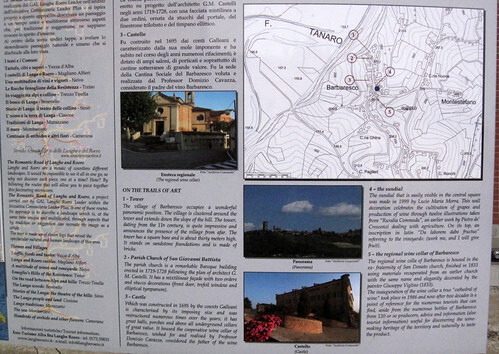 Those, of course, were paintings found on the side of wineries and near one of the famous towers of the area. 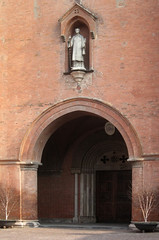 About twenty miles to the southwest of Asti lies the town of Alba. Alba is another large town dating from the time of the Roman Empire. 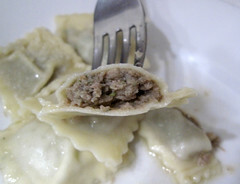 It is well known for its wines and especially its white truffles. 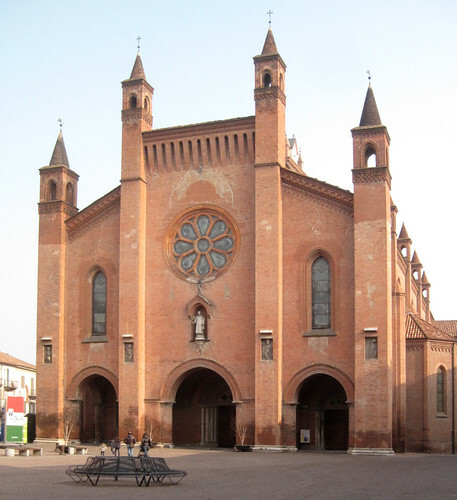 Alba offers the customary town square, this time with the Cathedral of San Lorenzo. 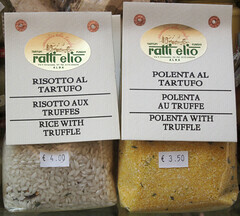 Although the famous white truffles of Alba were not in season, truffle based products are always for sale. 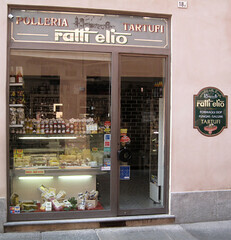 There are many shops specializing in pasta or other truffle flavored foods. 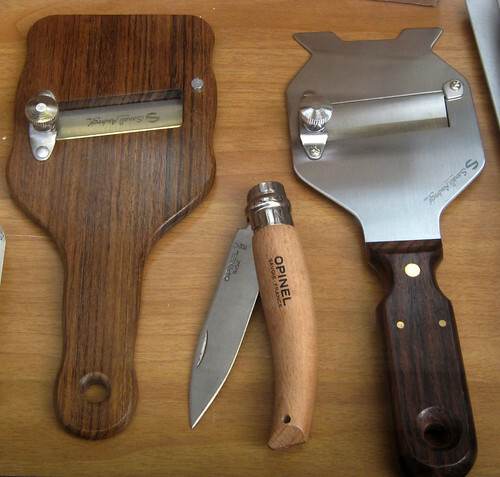 Since truffles are expensive and strong in flavor, you might want to buy a special tool to shave them into your favorite dish. 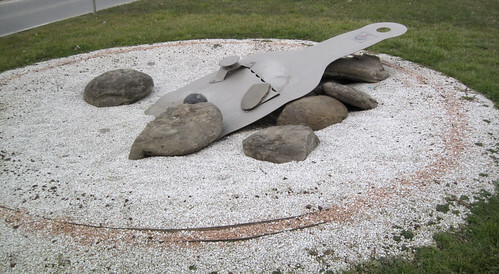 If that one is not big enough, this one at the entrance to town is about six feet long. 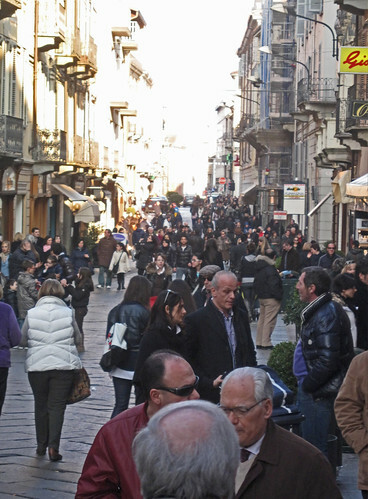 Narrow streets with shops offer numerous shops. Demonstrations and protests are the place to be this winter, world-wide. These women were joining the Sunday demonstration for diginity in protest of Italian prime-minister Burlesconi's behavior. 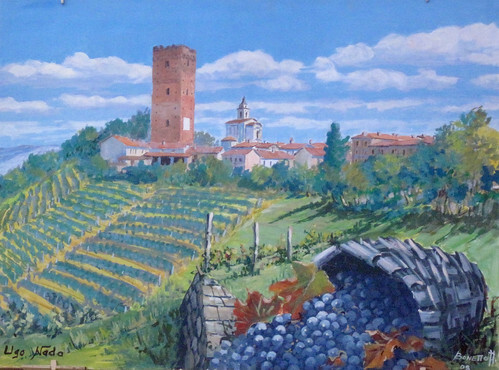 We made several trips into the town of Asti. 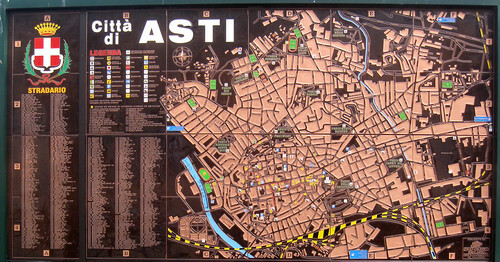 Asti is a good-sized city of 75,000 that dates from the time of the Roman Empire. 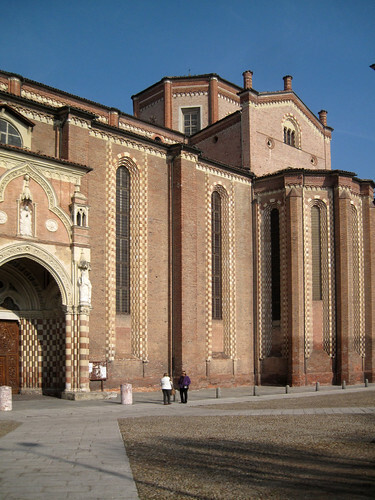 There are several public squares and a very large cathedral. 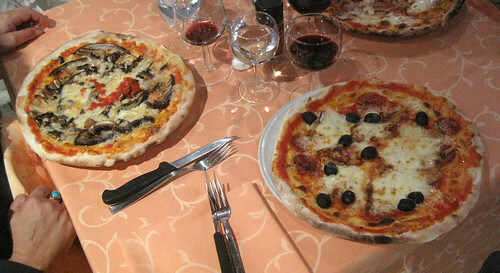 Maria directed us to an excellent pizzeria downtown. 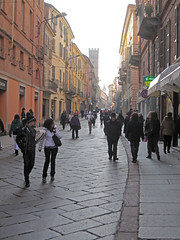 An excellent shopping street was also located downtown. Note the split hours for shopping. 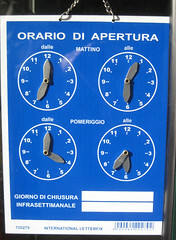 Like most places in Italy, stores and tourist attractions tend to be closed from about 12:30 until 4:00. After that afternoon break, the stores re-open and the crowds come back. 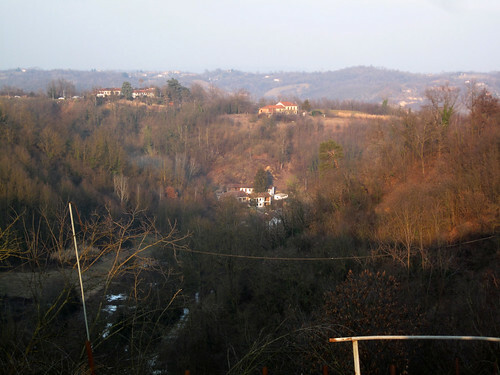 Bill and Maria actually live a bit northwest of Asti in the hilltop community of Sessant. The area reminds me a great deal of the area northwest of Portland, Oregon, where I grew up. The January climate was mild and moist. The hilltops were shrouded in fog for a good part of the day. Snow was visible on some of the valley floors in ares shaded by the hills. Homes are perched carefully on the very tops of the ridges overlooking the valleys. 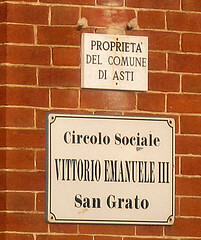 A tiny village with a church marks the actual community of Sessant. 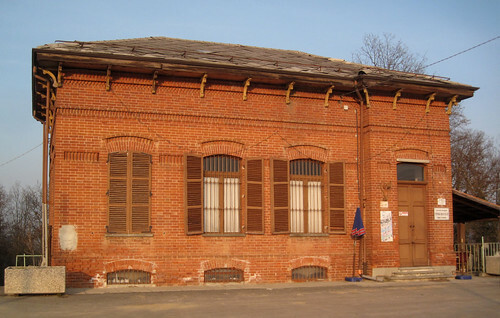 This community building is the town's social center. Notice the sign to the right of the door. 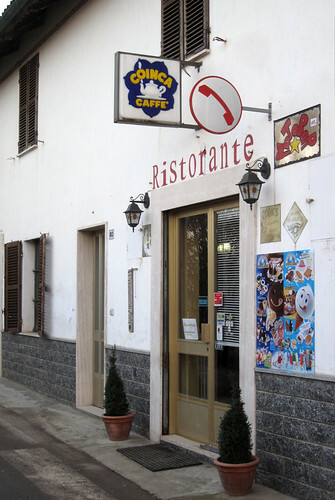 This is a Circolo, the simplest form of Italian restaurant. Here is the more formal restaurant in the village. 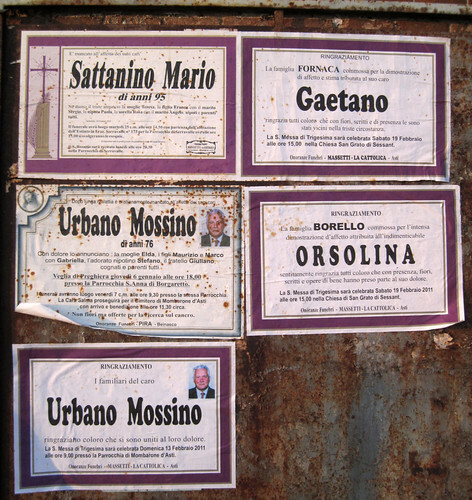 An interesting aspect of Italian culture is the posting of obituaries in a public place, frequently on the outside of the church but also in other public spaces. Do We Have Any Money Left? Athens - Like New York or Like Cairo? So What's the Price of Gasoline in Europe?